Study Spanish in Latin America. Learn to Speak Quickly! Why Learn Spanish in Latin America? 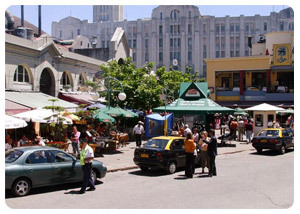 Learn Spanish and Explore Montevideo! It might sound obvious, but it’s always better to learn a language while living in a country that speaks it. It makes the process of language learning easier and faster, with better results, more inspiration and more fun! By traveling to Latin America to learn Spanish, you’ll meet new people and a new culture, which will inevitably help you understand and practice the language. Learning to speak Spanish is much more fun than learning the formal structure behind the language – by traveling to Latin America, you’ll be learning to communicate with everyday people who speak it. This is the kind of learning experience you can have by traveling to Latin America and taking courses at a school like Spanish Uruguay. Here at Spanish Uruguay, you’ll take an active part in everyday life, be with people, and exchange cultural information. You’ll speak. read, and listen to Spanish everyday, and gradually understand how the people around you think, behave, and live. In such a setting, learning becomes even more fun and rewarding! Latin America is full of cultures rich in celebrations and exchange, where you’ll enjoy conversations on the street or at parties and enjoy the beautiful landscape and environments cities have to offer. We can guarantee that learning Spanish in Latin America is a unique experience. And the best part is that at a place like Spanish Uruguay, we can help you arrange travel excursions, book tours to nearby countries or areas, and help find you the best possible accommodations. We’re here to teach, but also to make you feel comfortable, safe, and at home while you travel and study.